The UC California Naturalist program successfully completed its first UC ANR five-year statewide program review. Associate Vice President Powers and I extend a thank you to the ad-hoc committee for their time commitment and thoroughness in examining the program and providing recommendations to UC ANR's Program Council. The time Adina Merenlender, California Naturalist director, and Greg Ira, program coordinator, spent providing detailed information on all aspects of the program is also greatly appreciated. Last, but not least, a big thank you to all the UC California Naturalists, instructors and partners who submitted feedback during the review. 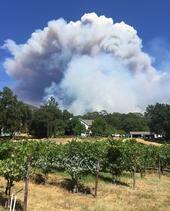 This was the view of the River Fire consuming the upper pastures of Hopland REC on Friday from Glenn McGourty's home. There are several large fires threatening communities all over the state and causing concern. I want you to know we've been in touch with our colleagues in the fire zones and everyone is safe. Here's an update from the affected areas. In Lake County, the UCCE office is closed and most of the staff evacuated from their homes due to the River and Ranch fires. Nearby highway entrances are closed: Hwy 175 from Hopland and Hwy 20 from Ukiah and Hwy 29 from south of Lakeport to Hwy 20 to the north.